Cancer-related fatigue is not usually an isolated symptom. Cancer-related fatigue, defined as distressing and persistent physical, emotional, and/or cognitive tiredness or exhaustion related to cancer or cancer treatment, is seldom an isolated symptom and is typically a component of a symptom complex that may include depression, anxiety, and sleep disorders. Although fatigue is one of the most common symptoms reported by patients undergoing cancer therapy, interventional studies to reduce cancer-related fatigue have been compromised by the complexity of the problem and the lack of an objective measurement of a mostly subjective symptom. Therefore, researchers sought to identify physical, neurocognitive, and serologic markers that may correlate with self-reported fatigue before and after (neo)adjuvant chemotherapy for patients with early-stage breast cancer. For the study, investigators enrolled 25 patients with stage I to III breast cancer planning to receive 4 cycles of dose-dense doxorubicin and cyclophosphamide. 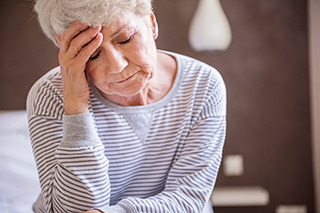 Researchers assessed patients before and after the completion of chemotherapy for fatigue, depression, 28 objective measures including grip strength, 6-minute walk, daily total energy expenditure, 14 neurocognitive tests, and 10 serologic biomarkers. Results showed that only IL-12 was significantly associated with cancer-related fatigue at both assessments (P <.01). Researchers found that serum eotaxin (P <.01), IL-1RA (P <.01), monocyte chemoattractant protein 1 (MCP-1) (P <.01), and performance on 2 neurocognitive (Trail Making) tests (P <.01 and P =.02, respectively) were inversely associated with fatigue prior to receipt of chemotherapy but not afterward. In contrast, daily energy expenditure, serum MCP-1, and serum macrophage inflammatory protein 1a (MIP-1a) were associated with fatigue after chemotherapy but not beforehand (all P <.01). Of note, the association between energy expenditure and fatigue was present only when an actively athletic subject was excluded. Although this study was limited by its small sample size and the many factors that contribute to cancer-related fatigue, the findings merit further investigation of IL-12 as a marker for cancer-related fatigue in other populations of patients undergoing different treatment modalities.